Once again it’s Mitzula here, the Milky Way Galaxy’s Ambassador for Shecky Greene’s Intergalactic Sportsbook & Cantina. 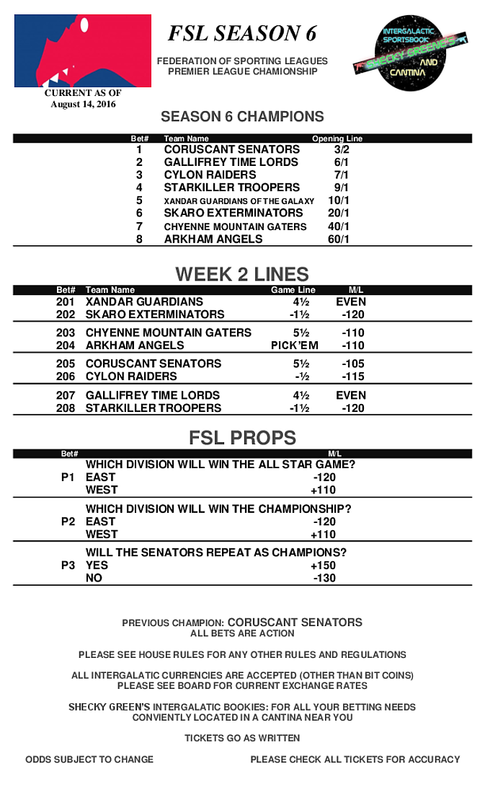 Our sincerest apologies for not having Week 1 lines for Season 6, with the Intergalactic Gaming Commission allowing us to book the Olympic Games in every Galaxy this year we’ve been a little overwhelmed. With out any more delay, here are your FSL Week 2 Lines. Bet Early & Bet Often! This entry was posted in News by mitzula. Bookmark the permalink. I’m a bit dissapointed that the Swiss Overwatchers aren’t competing here. Former member Winston of the long disbanded team has recently done a recall, and with success. Former team members have massively responded, and even new members have applied. And even though there are still many unresolved quarrels (that some rumor are the cause of the original disbanding), they shine in their team work. I don’t think former team captain Morrison will take up the position to lead.